Meet each challenge with the right equipment for the job. 5 and 6 Series Utilty Tractors Take on the big jobs with equipment that maximizes performance and comfort. (1) Offer valid February 1, 2019 until April 30, 2019. 0% APR purchase ﬁnancing for 72 months on new John Deere 1-3 Series Tractors. Down payment may be required. Monthly payments/cost of borrowing will vary depending on amount borrowed/down payment. Some conditions apply. See your participating dealer for details. Offer subject to availability and may be discontinued or modiﬁed. Taxes, setup, delivery, freight and preparation charges not included. Taxes, set-up, delivery, and freight charges will apply. Minimum ﬁnance amount may be required; representative amount does not guarantee offer applies. The charge for amounts past due is 24% per annum. Dealers free to set individual prices. Additional dealer fees may apply. Financing on approved John Deere Financial credit only. See dealer for details. May not be combined with other offers. Discounts or other incentives may be available for cash purchases. By selecting the purchase ﬁnancing offer, consumers may be foregoing such discounts and incentives which may result in a higher effective interest rate. (2) Offer valid February 1, 2019 until April 30, 2019. 0% APR purchase ﬁnancing for 60 months on new John Deere 1-3 Series Tractors. Down payment may be required. Monthly payments/cost of borrowing will vary depending on amount borrowed/down payment. Some conditions apply. See your participating dealer for details. Offer subject to availability and may be discontinued or modiﬁed. Taxes, setup, delivery, freight and preparation charges not included. Taxes, set-up, delivery, and freight charges will apply. Minimum ﬁnance amount may be required; representative amount does not guarantee offer applies. The charge for amounts past due is 24% per annum. Dealers free to set individual prices. Additional dealer fees may apply. 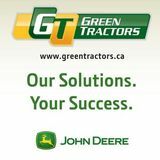 Financing on approved John Deere Financial credit only. See dealer for details. May not be combined with other offers. Discounts or other incentives may be available for cash purchases. By selecting the purchase ﬁnancing offer, consumers may be foregoing such discounts and incentives which may result in a higher effective interest rate. (3) Offer valid from March 1, 2019 until April 30, 2019. Attachments and implements sold separately. Some conditions apply. See your participating dealer for details. Offer subject to availability and may be discontinued or modiﬁed. Taxes, setup, delivery, freight and preparation charges not included. *Tractor packages include one bundle option in sale price. Bundle options are as follows: Bundle 1 includes HD09 Horst pallet fork and iMatch hitch; Bundle 2 includes STIHL® BR600 backpack blower and STIHL® FS70 trimmer; Bundle 3 includes STIHL® MS250 chainsaw and STIHL® BR600 backpack blower. No combinations or substitutes accepted. In replacement of BB5048 Box Blade, two bundle options can be selected. Offer subject to availability and may be discontinued or modiﬁed at any time. Restrictions apply. See dealer for details. ^Tractor packages include one bundle option in sale price. Bundle options are as follows: Bundle 1 includes BB5060 box blade and forklift; Bundle 2 includes PHD200 post hole digger with 12” bit; Bundle 3 includes RC2060 rotary cutter for an additional $500. No combinations or substitutes accepted. Offer subject to availability and may be discontinued or modiﬁed at any time. Restrictions apply. See dealer for details. (A) For example, on a 1025R Tractor with loader and backhoe, based on a selling price of $25,900 less a $3367.00 down payment ( which equals 13% HST) results in a balance of $25,290 to be ﬁnanced for a maximum of 6 years with 72 monthly payments of $360 per month totaling $25,920 based on 0% APR with a cost of borrowing of $0. (B) For example, on a 1025R Tractor with Loader, 54D mower deck and BB5048 box blade, based on a selling price of of $24,350 less a $3165.50 down payment( which equals 13% HST) results in a balance of $24,350 to be ﬁnanced for a maximum of 6 years with 72 monthly payments of $338.20 per month totaling $24,350 based on 0% APR with a cost of borrowing of $0. (C) For example, on a 1023E Tractor with Loader, 54D mower deck and BB5048 box blade, based on a selling price of $20,000 less a $2,600 down payment results in a balance of $20,000 to be ﬁnanced for a maximum of 5 years with 60 monthly payments of $333.33 per month totaling $20,000 based on 0% APR with a cost of borrowing of $0. (D) For example, on a 2025R Tractor with Loader, 60D mower deck and BB5048 box blade, based on a selling price of $26,600 less a $3,485 down payment results in a balance of $26,600 to be ﬁnanced for a maximum of 5 years with 60 monthly payments of $443.33 per month totaling $26,600 based on 0% APR with a cost of borrowing of $0. (E) For example, on a 3025E Tractor with Loader, based on a selling price of $24,500 less a $3,185 down payment results in a balance of $24,500 to be ﬁnanced for a maximum of 5 years with 60 monthly payments of $408.33 per month totaling $24,500 based on 0% APR with a cost of borrowing of $0. (F) For example, on a 3032E Tractor with Loader, based on a selling price of $28,500 less a $3,705 down payment results in a balance of $28,500 to be ﬁnanced for a maximum of 5 years with 60 monthly payments of $475 per month totaling $28,500 based on 0% APR with a cost of borrowing of $0. (G) For example, on a 3038E Tractor with Loader, based on a selling price of $31,500 less a $4,095 down payment results in a balance of $31,500 to be ﬁnanced for a maximum of 5 years with 60 monthly payments of $525 per month totaling $31,500 based on 0% APR with a cost of borrowing of $0. Perfect for those seeking the versatility of smaller models with extra horsepower to do heavier duty tasks such as hauling or lifting more weight. Lawn Equipment Make lawn care easier than ever with various mower deck sizes and attachments for every season. Gator™ Utility Vehicles Work hard and play hard with best-in-class ride quality and the power to tow through any terrain. Get ALL of the tools you need for one affordable monthly low payment and with 0% Financing - get your projects done with pride.